PATTERN CRIMES, one of the most highly praised of William Bayer’s novels, is set in contemporary Jerusalem…not the idealized Holy City of the guidebooks, but a real city, capital of an angry, anguished, torn-up nation — a city of prostitutes, narcotics dealers, lusting journalists, ruthless politicians and zealots of every stripe. 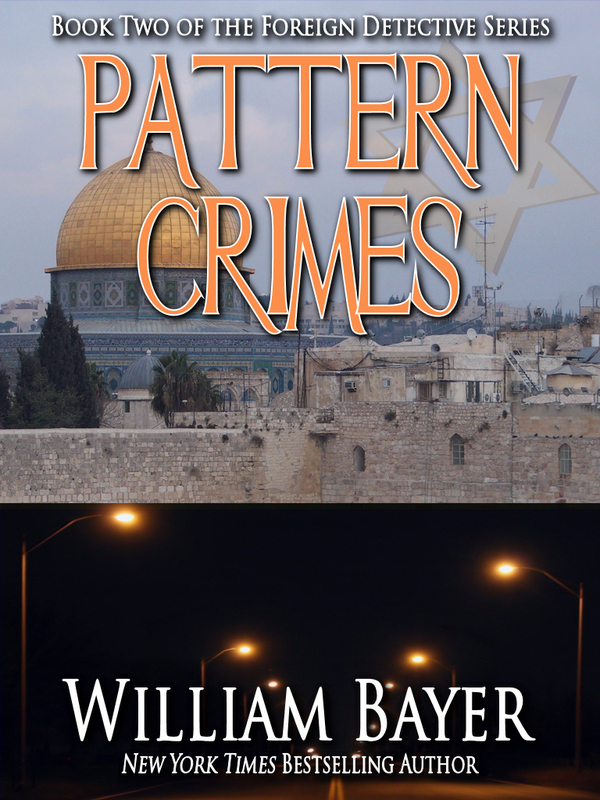 In PATTERN CRIMES Jerusalem becomes an arena for a remarkable story of crime, punishment and redemption. The story begins when the strangely marked body of a young prostitute is found just outside the walls of the Jerusalem’s Old City. A similarly disfigured corpse of an American nun turns up. Then an Arab boy. As the list of victims grows, their only apparent connection the bizarre markings on their bodies, it appears that Israel is facing its first serial murder case. David Bar-Lev, chief of the Pattern Crimes Unit of the Jerusalem police, is not so sure. A tough yet sensitive investigator with a powerful intelligence and a querying mind, he begins searching for a pattern that will explain the apparently random killings. • The possibility of corruption within the Jerusalem police and the ultra-secret General Security Services (Shin Bet). PATTERN CRIMES is a book about patterns – in love, in relationships, in politics, in art, in death. And always at the center is David Bar-Lev, one of the most memorable characters in recent crime fiction, relentlessly searching for the pattern that will unlock his case – the pattern he must uncover in order to clarify his vision. . .of himself, his family, and the country that he loves. With PATTERN CRIMES William Bayer raises the detective novel to a new level of excellence. In the best-selling tradition of his previous novel, Switch, he has created a powerful story of psychological suspense and one of the strongest, most intriguing novels of recent years. WILLIAM BAYER is a New York Times best-selling author specializing in neo-noir/psychological crime fiction. Here you will learn about his background and find descriptions of his books currently available in ebook and audiobook editions. Here too you can read excerpts from his soon-to-be-published work and learn about his current work-in-progress.